Flame detectors or scanners are regularly deployed in combustion applications as a means of confirming the presence of flame in a combustion chamber. The verification that fuel flowing into the utilization equipment is being properly burned and not accumulating unburned in the combustion chamber is the first line of safety in combustion. 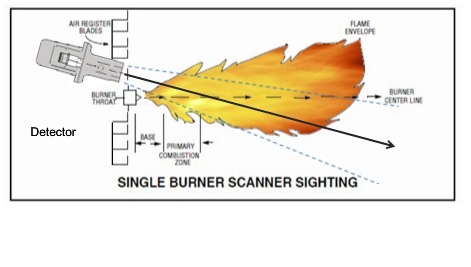 Flame scanners use the characteristics of combustion and the electromagnetic emissions from burning fuel to detect flame and distinguish among flames from multiple burners. The instruments rely heavily upon operating principles utilizing visible, infrared, and ultraviolet light measurement and detection. In single burner applications, simpler sensor and controller combinations can work suitably, but multiple flame applications are candidates for more complex detection devices and controls which can discriminate among multiple flames. Differences in individual flame characteristics, indicated through combustion products, can be utilized to distinguish between flames from different burners. Some photoelectric detectors can distinguish a signature flicker in flames of any type, invisible to the human eye. Knowledge and understanding of the flame itself, its emissive attributes, and other characteristics are the key to proper flame detection. This may include the temperature of gases within the flame and its specific gas products. Other than temperature, electromagnetic radiation and ionized gas molecules in the flame are commonly used by flame scanners or detectors. A variety of flame scanners are available for industrial and commercial use, each optimized for particular application sets. Essentially you have a scanner, which acts as a sensor. The signal from the scanner requires amplification and further processing to provide a reliable control signal. Hardware is available as discreet components, allowing a combination of scanner, amplifier, and control units to be combined into a system tailored for specific application requirements. Integrated systems are also available, with all appropriate detection and amplification circuitry built into a single compact unit. Share your combustion process challenges with application specialists and combine your facility and process knowledge with their product application expertise to develop effective solutions. Integrated Flame Scanner for Industrial Combustion Operations from Classic Controls, Inc.